The second half offense was just plain offensive. Prior to the final drive that ran out the clock, the Bears had the ball 5 times, picked up 3 total yards, and went 3 and out five times. At least they didn’t turn the ball over, I guess, and they were able to run out the last 3:36 of clock with two 1st downs on the ground. It was a rough day for the offensive line, which struggled to open holes in the running game and consistently failed to buy time in the passing game. The running struggles are understandable, as teams are stacking the box expecting the run, but such poor efforts in pass protection need to improve. The Panthers picked up 4 sacks in only 11 called pass plays, which can partly be blamed on a rookie quarterback, but is also on the offensive line. It was also a rough day for QB Mitchell Trubisky, who struggled under pressure, held the ball too long, and missed some throws as well. On one particularly bad play, he tried to force a pass in to well-covered tight end Zach Miller, sailed the pass, and almost had it intercepted. He wasn’t asked to do a lot in this game, but didn’t look particularly good when he was. There are always going to be growing pains for a rookie, and they were very evident in this game. Hopefully Trubisky can learn from watching this film. It’s worth noting that Tarik Cohen did not get a single carry in this game. He was involved in the passing game, with three targets (and a fourth called back due to penalty), including two that were down the field. I don’t know if this was a one-game thing based on the matchup or shows a change in how the Bears will use him going forward. Credit running back Jordan Howard, who ran hard with nowhere to go the whole game. Though the final numbers were ugly (21 carries, 65 yards), he ran through tackles late in the game to pick up two key first downs and run the clock out. After their first truly dominant performance of the season last week, Chicago’s defense looked like they might be headed back to earlier season problems on the first drive. The Panthers marched down the field with ease, picking up nearly 50 yards on their first 8 plays to move into scoring range. Giving up points on the 1st drive has been a continuous problem for this defense under Fox and Fangio. Then the Bears forced a fumble, and rookie Eddie Jackson picked it up and ran it back for a touchdown. This made it three straight weeks the Bears did not give up points on the first drive. Just for good measure, the defense followed that up with two straight three and outs in which Carolina lost yards. On Carolina’s 4th drive, they moved the ball into scoring range again before Jackson grabbed a tipped pass and returned it for another touchdown. The defense proceeded to keep Carolina in check for the rest of the game, making this a 2nd straight dominant performance from a defense that appears to be gelling and making the leap from good to great. Speaking of dominant, it was a good day for Chicago’s pass rush, which logged 5 sacks of Cam Newton and had him regularly running away from pressure outside of that. It was a group effort, as 6 front 7 players got in on the action. Akiem Hicks continued his all pro-caliber season by picking up his 6th sack and also had a 2nd sack negated by a face mask penalty (he also had several big stops against the run). Leonard Floyd also picked up a sack, and had a 2nd slip away when he had Newton wrapped up but Cam somehow managed to throw the ball away. It was a monster game for Floyd, who harassed Newton all day. Pernell McPhee and Danny Trevathan both grabbed a solo sack, and Eddie Goldman and Mitch Unrein split one as well. Cornerback Kyle Fuller continued his breakthrough season as well. Carolina repeatedly threw at him, but he was always in position, and he continued his excellent tackling in run support. On one particularly excellent play, Fuller came up to bring Cam Newton down on a scramble for no gain, then got up barking at Newton. That’s an edge we haven’t seen from Fuller before. He went to the locker room with an arm injury in the 2nd quarter, returned, and then left again after making a tackle in the 3rd quarter. Fuller’s replacement, Marcus Cooper, did not fare so well. He came in and promptly whiffed on a tackle to give up a 3rd and long conversion out of a busted play. Fuller returned the following drive. While I’m talking about the cornerbacks, let’s give a hat tip to Prince Amukamara as well. He tipped the pass that Eddie Jackson caught and returned for a touchdown, and played solid coverage throughout the game. safety Adrian Amos made a key tackle in bounds just before halftime, forcing Carolina to use its last time out. As a result, the Panthers ran out of time after catching the ball in bounds that put them in field goal range. And while we’re in the secondary, how about a little more praise for Eddie Jackson, who has established himself as Chicago’s best safety less than halfway through his rookie season. He became the first defensive player in NFL history to score two 75+ yard touchdowns in the same game this week, and continued to provide solid coverage and run support throughout the game. Jackson had a knack for making big plays in college, and it’s nice to see that start to translate to the NFL. Adrian Amos continued his resurgent season as well, providing several nice tackles both against the run and in coverage. On one key play just before halftime, he tackled the pass catcher in bounds, forcing Carolina to use its last time out. As a result, the Panthers ran out of time after catching the ball in bounds that put them in field goal range. Amos seems to be thriving at his more natural strong safety position, which he can play next to Jackson. It looks like the Bears might have found a good safety tandem for the first time in over a decade. If there’s one bone to pick with the defense, it’s that they really struggled to get off of the field on third down, though to their credit this did improve as the game went on. Carolina converted on 5 of their first 9 third down opportunities, including several 3rd and long plays where a defense simply needs to make a stop. 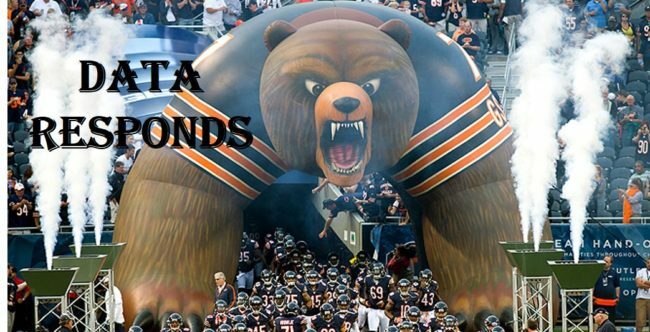 The Panthers ended up 6 of 15 on 3rd down, so the Bears fixed this problem down the stretch. I neglected to mention Eddie Goldman in my column last week, an error which I intend to rectify now. He’s been very stout up the middle this year, including a big stuff of Cam Newton on 4th and 2 in the third quarter. Another defender I forgot last week was Danny Trevathan, who had a monster game against Baltimore after his one week suspension. He was a monster in this game too, picking up a sack for a second straight week and grabbing an interception in the fourth quarter. In between those big plays, he did a good job defending the run and in pass coverage. It was an ugly effort by the special teams unit for the 2nd week in a row, though not nearly as disastrous as giving up 2 touchdowns last week. This time, they did have a missed field goal, as Connor Barth’s low kick from 52 yards out was tipped. Roy Robertson-Harris also had a holding penalty on a Carolina punt that should have given Carolina a first down, though thankfully the referees mistakenly decided the penalty came after the punt was away.